Do you ever feel like your dogs aren’t really listening to you? But I hadn’t really taught my dogs their names. I hadn’t taught them to use their listening skills to absorb what I was saying so they could actually do what I asked, instead of just hearing my voice and quickly guessing what I wanted. I also wanted to teach them their names so I could call them individually. Cow tends to trample Matilda, and while Matilda has learned to stay out of her way, it would be nice if Cow could wait her turn, instead of bulldozing through in a rush to be first all of the time. Do they realize they have names, identities, or do they just learn to react to a specific combination of sounds? Does Cow know that Matilda is Matilda, and vice versa? 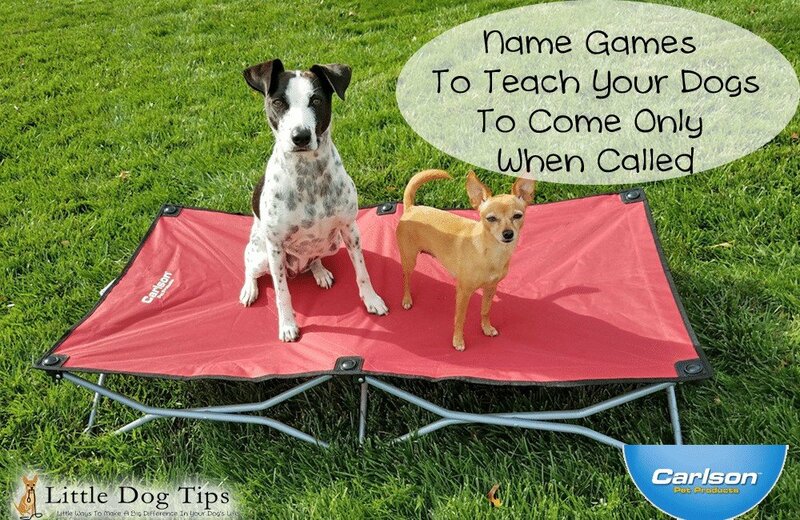 To help my dogs listen better, learn to wait their turn, and possibly develop a higher level of self-awareness, I played a few games with their Portable Cot from Carlson Pet Products to teach them their names. I worked with Carlson Pet Products to bring you this post, and like always, I only feature products that I absolutely love and recommend. I used their cot at the dog beach to create a home base where we would rest and snack on fruits, so they already know that good things happen when they hop into their cot. Matilda loves it so much that she dives onto it. For the first name game I played with the dogs, I worked with them individually. It’s fun to train them together, but when it comes to new concepts, it’s easier to work with one at a time. I started with Cow. I had her sit on the cot just a foot away from me. I had her stay, come, and sit on the cot again. Then, I started to call out random names and words instead of her name. At first, I only said one random name before actually calling her. I praised her and rewarded her heavily when she stayed still until I called her. If she came when I said anything else, I did not give her a treat, I just asked her to sit up on the cot again. Then, I made the exercise easier by calling out fewer names. Pretty soon, she started to listen intently for her own name. I did the same exercise with Matilda. So, now my dogs were a bit more careful about listening for their names. To make this even harder, I called out Matilda’s name – while Matilda was not present – and taught Cow not to respond to it. Oops – my dogs had thought, for some time, that they were each both Cow AND Matilda. Or, they may have realized that the sound of either name meant something good was about to happen, and didn’t want to risk missing out on a treat. Next, I brought my dogs together on the cot. I called Matilda. Cow usually still followed behind her, so I just asked Cow to step back up on the cot, and gave her a treat when she got there. At first, I had to be very quick about catching my dogs responding to the same call with separate actions. I needed to both reward Matilda for coming, and Cow for staying. To make it easier, I stayed very close to the cot, and tossed a treat onto it, or into Cow’s mouth, if she managed to stay still for just a moment after I called Matilda. Treating Matilda was secondary because she was already very good at coming to me. I practiced this a few times without switching dogs. I focused on teaching Cow to stay while I called Matilda. Cow soon realized that it was very rewarding to stay on the cot and gobble up treats as they were delivered to her. After Cow seemed to get the hang of this, I switched dogs. At first, Matilda kept coming, even though I was now calling Cow. I simply guided Matilda back to the cot and gave her a treat, then rewarded her quickly if she managed to not move when I called Cow. I didn’t allow enough time for her to step off. I didn’t worry as much about what Cow was doing until I was sure Matilda was staying on the cot. Now that both dogs had gotten a chance to learn to stay when her sister’s name was called, I was able to try calling both of them, to see if they would wait their turn. Like the other games, this took some practice to get right. I started in a specific order – Matilda, then Cow, and then switched it up only after they got the hang of the first order. Then I started adding random names and words to make it more challenging. You may have seen videos online of people calling large groups of dogs, one by one, by name. In some of these videos, the dogs seem oddly timid. They walk forward slowly, with their heads down, then shuffle by quickly once they’ve crossed the barrier. I can only suspect that these dogs may have been punished whenever they responded to a name that wasn’t their own. This is an advanced skill; when taught, there’s a strong chance that your dog will make mistakes. You don’t need to punish those mistakes to create quick, precise advancement. It’s totally unnecessary. Dogs are clever. If you simply as the “wrong” dog to step back into the designated waiting area (in my case, clearly marked with the elevated cot), and only reward them when they make the right choices, they’ll enjoy these games much, much more, and they’ll be eager to learn. Dogs will never gain a humanlike sense of self-awareness. Names are never going to mean much to them. And this game is not truly important; it’s not worth making your dog anxious if they are getting frustrated and keep making mistakes, even if that just means missing out on a treat. To make name games easier, stay close to your dogs, and shorten your timing. If your dog makes a mistake, set them up to succeed, even if they don’t understand the concept yet. Ready to teach your dogs the name game? You can win a portable cot like ours from Carlson Pet. Must be 18+ and live in the USA to win. Buy yours today from Carlson Pet Products. It’s really interesting. I don’t know if I would try it with my pup as she is a senior dog now. We play a lot of games with our dogs. We enjoy this as much as they do! There are some really good ideas in your article! Thanks. this is worth trying! Cool site/info, thanks for sharing! Yes, I’ll do this with my dogs. My dog is older and very stubborn; I’m not sure how well this would go over with him. I think our dogs know their names. I always speak to them by name. I’m sure my neighbors get very tired of hearing that but, oh well. we have to play games to keep her in shape for when she has to do her service dog duties.. so fun games always helps.. This is pretty cool!! It’s great to have the correct dog to come to his name. I play a lot of game with my dogs such as go find it and to find a treat under a few cups. I already play a version of this with my dog. She’s a really smart rescue and games have helped build her confidence. My dogs all know their own names, but that doesn’t mean they listen to me when I call them to come in (at least the two boys – my girl, Kyoko, comes right away). I do need to work with the boys when it comes to actually listening and responding when I call their names, though. I think it awesome and will deffeinetly give it a try. I will try this with my dog for sure. This definitely would be good to try with both of ours. Thanks for the idea! I will definitely try some of these games with my pup, Ozzie. When food comes into play, all manners go out the window! It would be great to be able to call the cats and have Ozzie wait his turn, rather than barreling over them to get there first. Yes, I would love to give it a try! We have two dogs so it will be interesting! This name game would definitely be worth at try! Penny loved playing games and learning New things! I have two shih tzu dogs and they are very hyper so I am always looking for fun things to do with them and yes I wil try name games with with them. Dogs are incredibly smart; I think sometimes mine understands English. I don’t know if she knows her name but she responds to different commands. I am certainly going to test her with these name games. (Treats are the greatest incentive ever!). Wonderful post! I really like this and want to try it! They know their names but often don’t actually listen to what I’m saying so practicing this could be beneficial! I really need to try this, my dogs always jealously come when I call the other! This is something we need to work on. We play a lot of games with our dogs. We enjoy this as much as they do! There are some really good ideas in your article! It’s really interesting. I don’t know if I would try it with my pup as she is a senior dog now. I think our dogs know their names. I always speak to them by name. I’m sure my neighbors get very tired of hearing that but, this is pretty cool!! It’s great to have the correct dog to come to his name. My dogs all know their own names, but that doesn’t mean they listen to me when I call them to come in at least the two boys – my girl, Kyoko, comes right away Dogs are incredibly smart; I think sometimes mine understands English. Thank you for sharing your article. I am always playing games with my dogs. I will try name games with my dog. Love these ideas and can’t wait to try the games. Thanks for a great post! My dog is older so don’t know if I would try this. She knows her name and has her own routine about most everything. Can’t teach an old dog new tricks. Or can you? Some good ideas here, thanks! These are great tips. When we had four dogs they all four would come when we called any of them because they didn’t want to miss out on anything, especially a treat. LOL Now we only have one dog. He knows his name just fine … his ears will perk if he hears it in conversation. But he’s a door-dasher, and if he gets out he will ignore us. I could always try but my dogs are pretty dumb I don’t think that they would listen lol. I would think my pop-pops dog Sammy would probably listen who knows. Always worth a try and to see how they react to it but I doubt it. I have a confession to make- I actually have two cats ( no dogs): Fred and Ginger respond to their names only when I have TREATS. I will definitely try some of these. I have a 1 year old boxer and he is so hyper. He is a good for though. I will defintely try it. I will have to try this with our youngest, he is 7 months old and I swear sometimes he doesn’t know his name, Whitley. I think I will try some of the ideas presented. I have 10 rescue dogs so I do this all of the time ! funny, sometimes they wont even come when i use their real name. i used to have 3 gals, i would call the wrong name, not realizing it, and wondered why they did not come… maybe if i use fake names they will come. if i call any name and have treats, they both come. Great game and way to teach your pet his name. My dog seems to know his name but I’m going to have to try it and see. If not, I know how to teach him now! My brother just got a Terrier so if I win this goes to him. I only get to visit once in a while and always bring treats when I do. I don’t know, my dogs are both senior rescues and truth be told they aren’t that bright to begin with (but I LOVE them!) and they are old. I try to teach them things, but they don’t learn very well. I definitely will play name games and follow quite a few of these tips. Thank you so much?? We play games with our Lucy she’s pretty smart for a Chihuahua ?❤? I love your blog post and might try the name games with my dog. I already do some of these with my dog to keep their mines sharp and active. My pup loves games I think he’d enjoy it. Jack is a 4 mo old, high-energy Aussie who loves to learn and please. Think he’ll enjoy this. we play games to keep my dogs energy down. Summerdog, Jackpot and I play games daily. I think their favorite is “find me”. I have them sit and wait, I go hide so where and then whistle for them – such fun they thunder thru the house looking for me. And their cookie reward. All of my dogs know their individual names and will respond to them. Well, when not using their selective hearing. That works for all but the 5 week old puppy. We play games with them, we wanna try this one now. im up to playing whatever with my princess !! I love playing games with my 3 dogs. They all 3 know their names and are very smart. They will do anything for a treat. i always enjoy playing games with my dog. she and i are pals. I don’t think we need to play the name game with my grandma’s dog. She is 8 years old and very clever. I think for some pets it becomes challenging when other words rhyme with their names. This is a great positive way to teach dogs to learn good behavior. I did something similar when my pooch was a puppy. Such fun ideas!! I might have to try that with my dogs! If they’ll play along haha they are their own personalities haha they’re kind of like cats. My little girl is 14 and still loves playing and learning new things. This cot would be great for when she wants to be out with me in the garden but wants to rest her little (70 lbs) legs. My dog truly knows his name. He also knows mine and my wife’s name. If I ask him to go find mom he will run to her. My girl listens well and is fairly easy to teach. I am going to be working on the name game! We love to play games with our dogs. My husband plays a game sort of like this one. I will tell him about it. I think these are fun ideas, I will for sure try these. I talk to my 3 dogs all the time, never tried the name game but will try. These are cute ways to train. I will definitely use this at some point. Thank you! I have yet to get me a dog but games sounds like an interesting thing to try when I get one this spring. My pug is so stubborn it would never work with him, but my lab on the other hand would be perfect at it. I will try them with my dog. I love her and she is always with me. I am definitely going to try this and I think it is very important to talk to your animals and interact with them. I think the kids would have a blast trying the name game with the dog. We might give it a try! I just got a new puppy less than a week ago, so he doesn’t really know his name yet, but once he does I think it could be something that we could do. Looks like it’s worth a try! Yes, I have smart labs that always need a new challenge or I find them challenging me! It is a little strange sounding but I like playing games with my dog so I may give it a try. Yes, so cool. I will definitely be trying this with my bulldogs. I think the games would be so much fun with my dog! Yes, getting the right dog at the right time can be critical at times. New tricks are good for all of us to learn! New tricks are a great way to keep a close bond.